Mr. Lovell Brooks’ store was just down the street from where my grandparents lived in the Cotton Mill Village in Geneva, AL. It was an old timey store where my grandparents, Payton and Virginia Phillips, “traded” as Grandaddy called it, for no telling how many years. Mr. Brooks was there before the retail grocery stores came to town. He beat the Piggly Wiggly and the IGA. My grandparents were loyal to Mr. Brooks, and his store, whose fate is unclear to me. My hunch is that the retail chains probably forced the closing of his store, either single-handedly or in conjunction with his health and advancing age. A favorite story of mine involving Grandaddy also includes Mr. Brooks. After we arrived home from “trading” with Mr. Brooks, something prompted Grandaddy to count his money. Responding to the look of sheer puzzlement on his face, Granny asked what was wrong. He pondered and pondered and finally said, “I just sho’ think they made a mistake in countin’ out my change. I come away with $1.65 cents more than I should of.” Each of you can silently decide how you might handle this moral dilemma. Grandaddy handled it in only the way his character would allow. He promptly got back in his car, drove to Mr. Brooks’ store and returned the $1.65. That’s the stock from which I’m made. Unfortunately, I have only been able to come up with one photo of Mr. Brooks’ store . 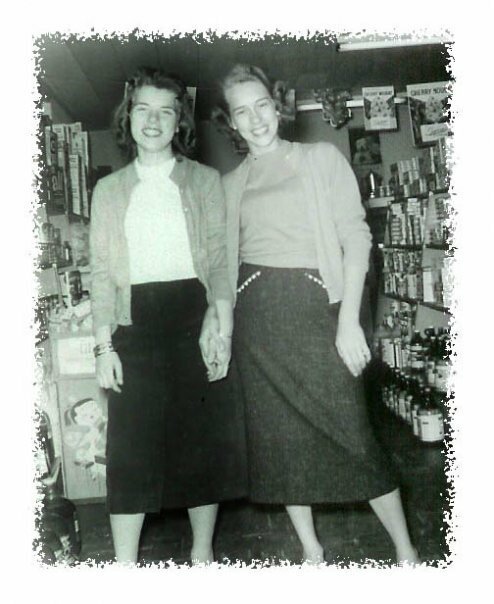 The picture below, from the 1950s, is of Sara Hatcher Hundley and Faye Riley Owens taken inside the store. Sara, right, was related to Mr. Brooks. I will have to rely on my mind’s eye to take you on a virtual tour. Let’s hope the lens isn’t covered with cobwebs. The store was located on the part of the main highway that was pretty close to town, the kind of downtown common to small towns where you park at an angle in front of the stores. It was a small store with parking for only a few cars in front. My recollection of a wooden facade and a single gas pump might not be entirely accurate. But that’s how I remember it, none-the-less. As you entered the front door, you just about ran smack dab into the checkout counter that housed the single cash register. Behind the cash register were shelves that contained items such as stick candy. 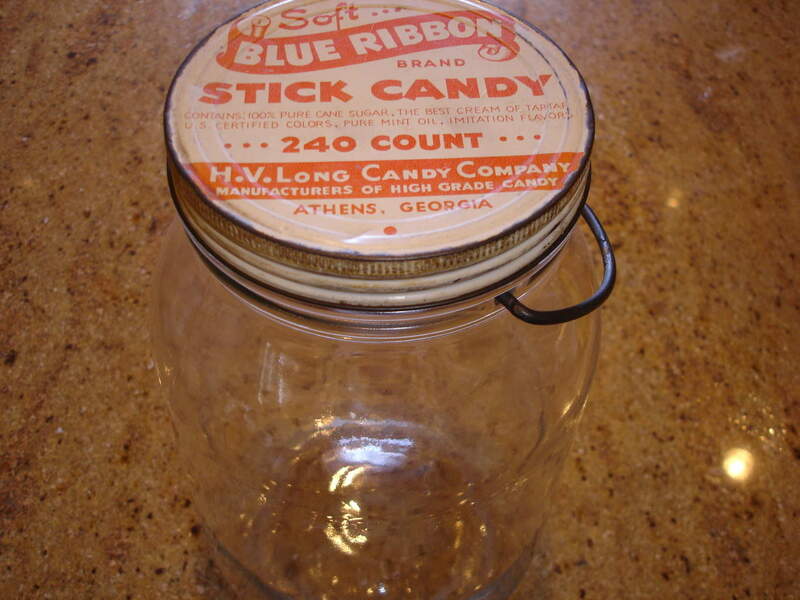 Below is a candy jar that Granny and Grandaddy got for me from Mr. Brooks. Different flavors of stick candy, such as peppermint and perhaps orange and lemon, were in the jar. I mostly remember the peppermint. The shelves behind the cash register held other things, too. Maybe tobacco products. Maybe Goody Powders and black plastic combs. I only need to remember the stick candy. To the right, was a freezer chest that contained ice cream bars and popsicles. I had one or two ice creams from this freezer chest. You pulled up the top and freezing sweet-smelling air rushed at you. So refreshing on a hot, humid Alabama summer day. If there was a “co-cola” machine, I can’t picture it in my mind but it probably would have been here, too. And it would have those little 6 1/2 ounce bottles. There were a few isles throughout the store where various food items were shelved. The very back of the store contained the meat counter. You selected your meat from the cuts on display and had them packaged. I don’t remember how much inventory this store had in the way of hardware items. That may have been on the left of the store away from the stuff that I cared anything about. But, back in the store was another case for dairy and frozen food. In that case is where we got these little frozen pies that we were crazy about. There were three flavors: lemon, coconut and chocolate. We would never buy chocolate because Granny didn’t like chocolate. We made up for it with the consumption of the lemon and coconut pies, though. The brand name of these little frozen pies is lost in my mind and I just can’t seemed to find where it’s filed. It seems to me the pies were smaller than a regular 9 inch pie. The flavor of the pies wasn’t remarkable, but the sweetness of the memory is overwhelming. We would make special trips to the store just to buy these pies. They were a treat. The recollection of one of those pie buying trips has forever stayed with me. Grandaddy and I went by ourselves to buy a lemon frozen pie. That was the sole purpose of the trip. We brought the pie home, sat at their little enamel kitchen table , under a pull string light that hung down from the ceiling, and ate the whole pie. Just Grandaddy and me. I’m not sure where Granny and my two sisters were, but they were no where around this pie eating session. Just Grandaddy and me. Parts of the conversation, if it even existed, aren’t vivid in my memory. Grandaddy may have said, ” This little pie sho’ is good, ain’t it, Jack?” I would have answered, “Yes sir!”. The words, or lack thereof, didn’t matter. What mattered was the moment with my Grandaddy. My sweet, quiet unassuming Grandaddy. Later that day, Granny was looking for the pie that she knew we purchased and brought home. She was bumfuzzled and wanted to know, “Just where is that pie?’ Oh, brother! I was going to let Grandaddy handle this one! He said, “We did buy it and Jack and me ate the whole thing.” Oh, lawd! She came out guns a-blazin’. She fumed and fussed and fumed and fussed some more. Grandaddy just laughed at her in his sweet little quiet way. I’m not sure Granny ever got over this because we heard about it for years….and years. She certainly never heeded her own admonition to us, “You better get glad in the same britches you got mad.” Every time the subject was brought up by her (we surely didn’t bring it up), she would fuss and fume and Grandaddy would laugh in his sweet little quiet way, again. 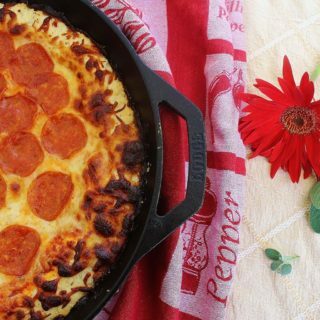 When Mr. Brooks bought those little frozen pies to sell in his store, he had no idea he was shaping the life of a little girl who would grow up, write a story about them, turn off her computer and cry. The pie in the story wasn’t a Lemon Icebox Pie but it’s similar. That little frozen pie had a lemon filling and some type of cream topping and it probably had a graham cracker crust. 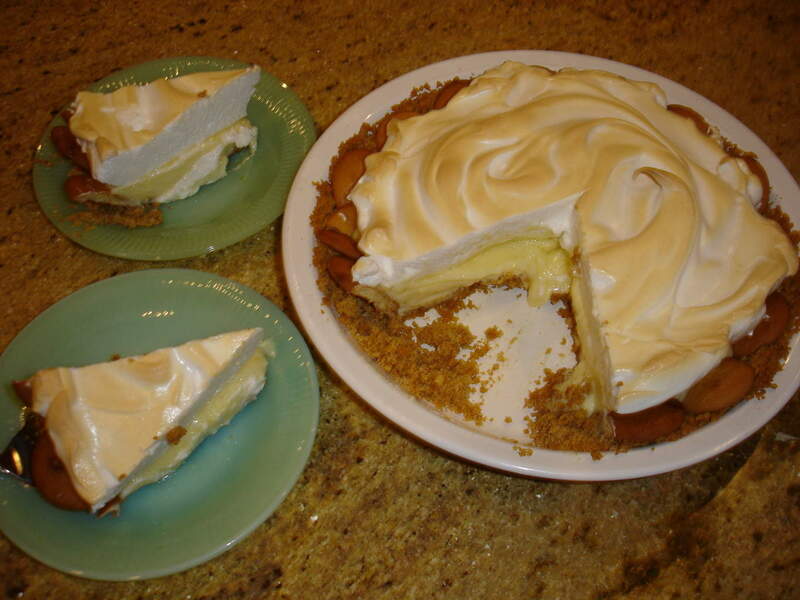 Lemon Icebox Pie is the one dessert that may be most closely associated with Southern cuisine. Well that and Red Velvet cake… and Coconut Cake…and Pecan Pie…don’t forget Lane Cake. There are several steps but none are complicated. 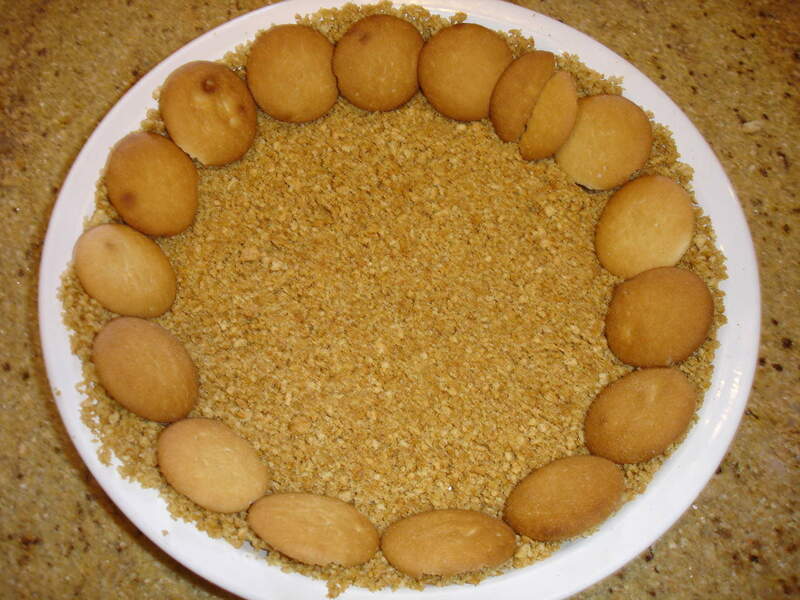 You may substitute a prepared graham cracker crust, but I like to nestle the vanilla wafers into the soft crust and then brown it. The difference in the flavor is worth the effort to me. 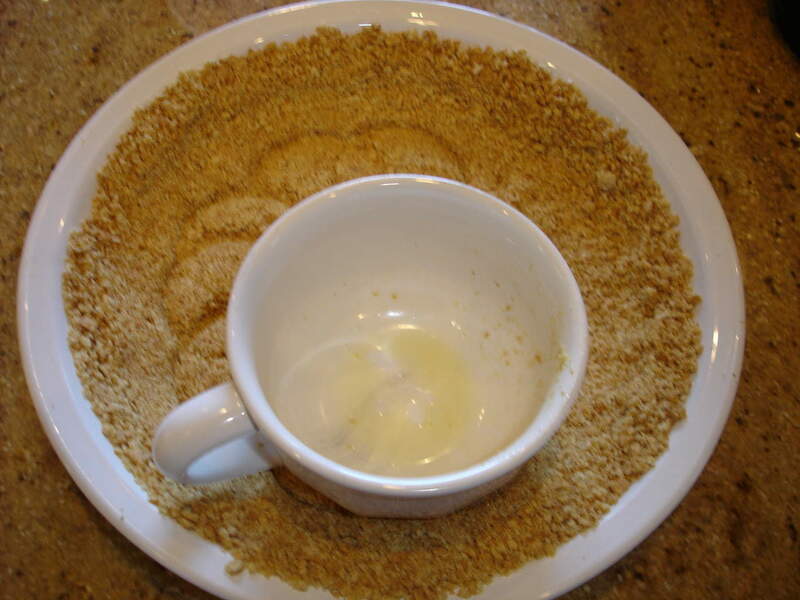 Make the graham cracker crust by crushing 16 squares of graham crackers. That’s one little package of the crackers. And I get to use my mini food processor! This is one of the neatest kitchen gadgets I own. It is made by Cuisinart and, in addition to the mini processor, it has a whisk and an immersion blender. Love it! Add melted butter and place in pie pan and form crust. I use the bottom of the butter melting cup just to help form the sides. Next, gently moosh the vanilla wafers into the side of the crust and bake at 350 degrees for 10 minutes or until the crust is lightly browned. Remove from oven and cool. 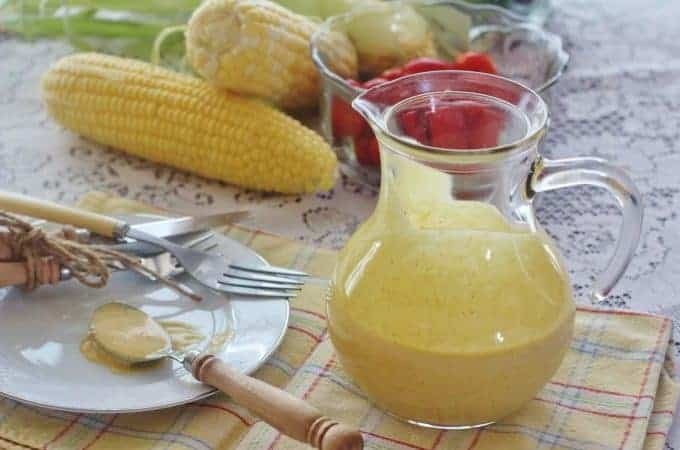 Whisk together egg yolks, lemon juice and sweetened condensed milk. Pour into pie crust and bake at 350 degrees for 10 minutes. Remove from oven and cool. 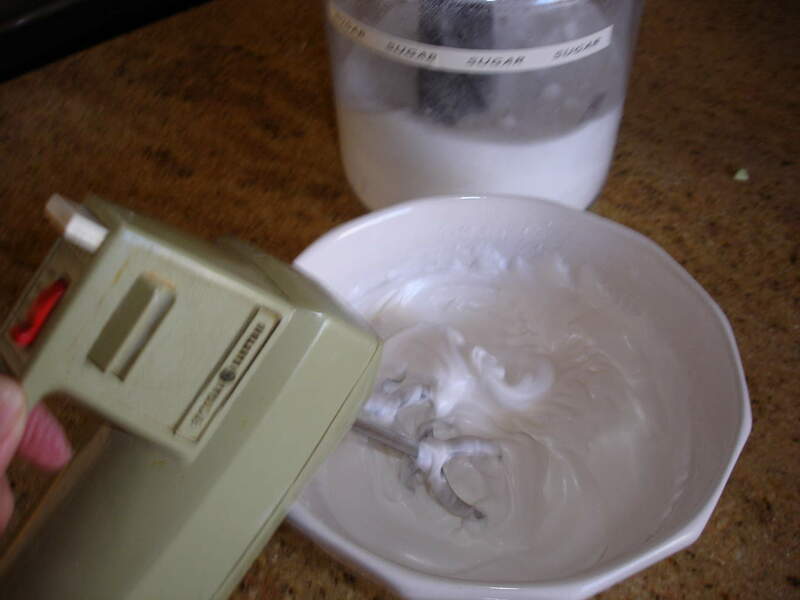 Mix egg whites, sugar and vanilla for meringue topping. Spread evenly over pie. The hand mixer is a General Electric avocado green that was given to me as a wedding gift 35 years ago. I’ve had it longer than I’ve had my children. Actually, I have it longer than I’ve had my husband! Form swirls and peaks in meringue and bake at 350 degrees for about 10 until lightly browned. 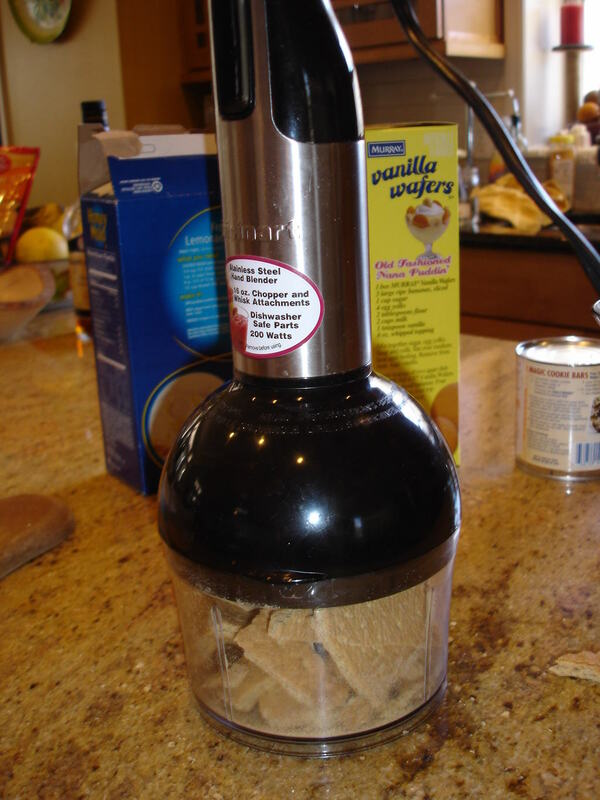 Finely crush graham crackers in food processor. Pour into bowl. Add melted butter and mix. Pat out into a 9 inch pie plate. 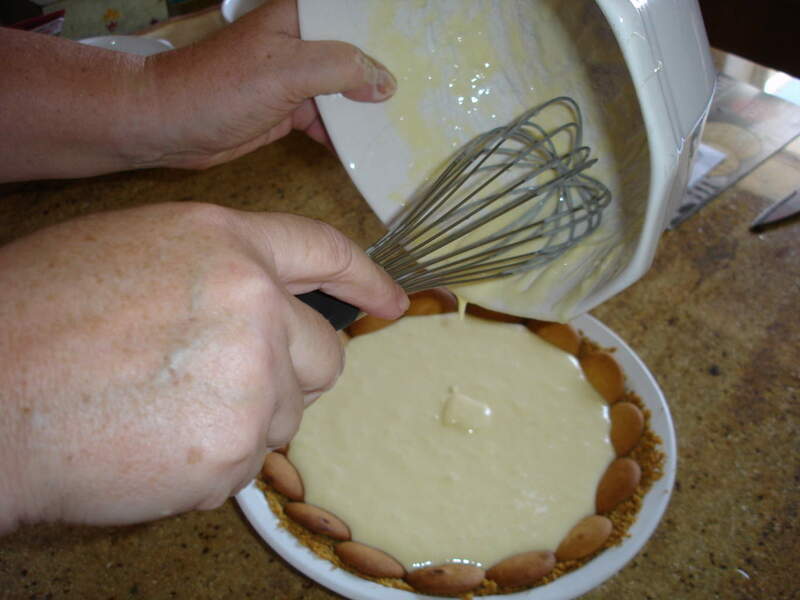 Gently add vanilla wafers along the side of the pie crust. Bake at 350 degrees for 8 to 10 minutes until lightly browned. Remove and cool. Add egg yolks and lemon juice to Eagle Brand and whisk well. Pour into cool pie crust and bake at 350 degrees for 10 minutes. Remove from oven and completely cool before adding meringue. Beat egg whites until stiff peaks form. Gradually add sugar and continue beating. Add vanilla and mix well. Cover cooled pie filling with meringue and form peaks and swirls. 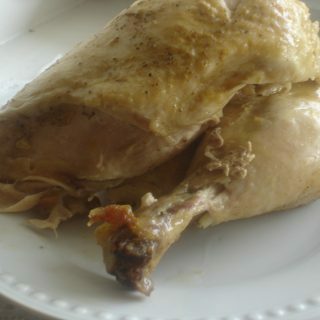 Bake at 350 degrees for 10 to 12 minutes until peaks are browned. Remove from oven. Am I going to cyr at all of your blogs? Bless your heart! The next one, “A Fair Surprise” probably won’t make you cry. I don’t think I made myself cry when I was writing it. Oh, wait. Maybe I did. Beautiful post, Jackie 🙂 I think we’re wired the same because many (perhaps most) of my best and most vivid memories involve enjoying good food with loved ones. Thanks, Mona and Chris. I love having you as readers. It feels good to shake the cobwebs off good memories, doesn’t it? LOVE reading all of your posts so much!! I could sit and “listen” to these stories all day! Thanks for sharing them with us all! I think your Valentine’s Day post may have been my favorite so far :))! Thanks, Laci. I love having you as a reader! Stick around because I have a few more stories in my back pocket. I can remember the layout of Lovell’s store very well, because I would walk up & down the aisles as my granddad and Lovell would catch up on the daily gossip. Seems like he had one of those big cooler boxes where the bottles of ‘co-colas’ and RC’s were actually standing in cold water. And we’d shake off the water before snapping the cap off. Does that ring a bell? After reading your description of the “co-colas” in water, that does seem right. Gosh, I wish we could drum up some pictures. I would love to recharge that memory. 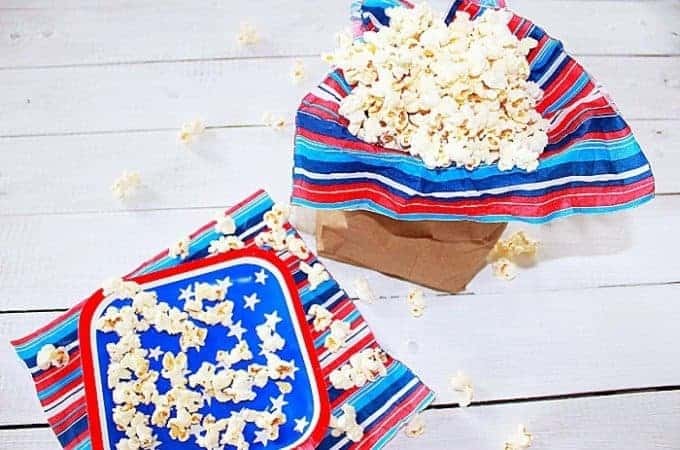 Speaking of the little co-colas, Granny and Grandaddy would punch holes in the caps with an ice pick and we would drink through the caps. Do you remember doing that? It’s comical, so say the least, how years and miles apart still evoke the same memories. I love the whole story,of course, but the memory you have dusted off for me is about punching a hole in the top of co-cola and RC bottles. I’d be too chicken to do it now for these younger chillun, but it was fun back in those days. Did y’all call the big RC’s “belly washers”? My Daddy did and I’ve not heard that term in many moons. Thanks for the memories Jackie. Are you familiar with “Reminisce” magazine? It’s full of old pictures and stories of days gone by. Have a blessed day Shug. I’ve never heard of Reminisce magazine but it sounds like it would be just up my alley. I’ll have to look it up. Calling RC Colas belly washers is new to me but I think it’s just charming! Have you submitted anything to Reminisce or good Old Days magazines? Right up your alley! I can’t believe I ran across your website – I too moved to Florida (Sarasota) from Mobile AL, about 24 years ago. This is definitely not the south I grew up in!! I have a daughter also, who is now grown and she was 8 when we moved, so it was hard to show her how to be southern with no other southerners around (except her relatives) but I can proudly say she is truly southern – she is living in New York right now but can’t wait to get back “down here” to her southern roots!. Welcome to Syrup and Biscuits! I hope you will visit often. We love having you as a reader. I can certainly relate to your story of wanting to ensure that your daughter has an appreciation for her southern heritage. We will be visiting Mobile this week. I will say “hello” to all the folks for you. We’ll definitely be trying this one… yummy!! I am thrilled to come upon your lemon pie recipe and hope to try it soon!! It looks yummy!! I would love to see pictures of your Jadite. Please feel free to post pictures on Facebook. I would love to see them! Please let me know what you think about the Lemon Icebox Pie! Thank you for this lovely post. This story reminds of the wonderfull times I had growing up with my Grandaddy & Grammy. I discovered you via Pinterest & a pin for Comeback Sauce. (Which tastes almost exactly like a dressing that my Grammy used to make.) Planning to make your Salmon Patties this week to go with it. Thanks for your stories & recipes. I’m so glad you found us! Pinterest is such a great idea. I wish I’d thought of that! 🙂 Please let me know what you think of the Salmon Patties with Comeback Sauce. I hope you enjoy it as much as we do. Welcome home! Loved this post Jackie. Even though I grew up in the city I spent hours with my Grandpa every week since we lived with them. He took me everywhere and just like you Grandma wasn’t always happy with our projects…why one day we came home with a new car..wasn’t she surprised! As for the frozen pie, did it have little flowers well more like little dabs of frozen whip cream all over the top? I remember those pies in chocolate and coconut too! Have a great day! I’m so proud that you shared your story with me. Comments such as yours let me know that Syrup and Biscuits was meant to be. There’s so much goodness in those wonderful, sweet memories. May we never forget them and appreciate them, always, for the valuable lessons we learned and the way they shaped the people we are today. Your comment means more to me than you will ever know. Such a sweet story. My grandparents (Kentuckians) always called it “trading” as well. 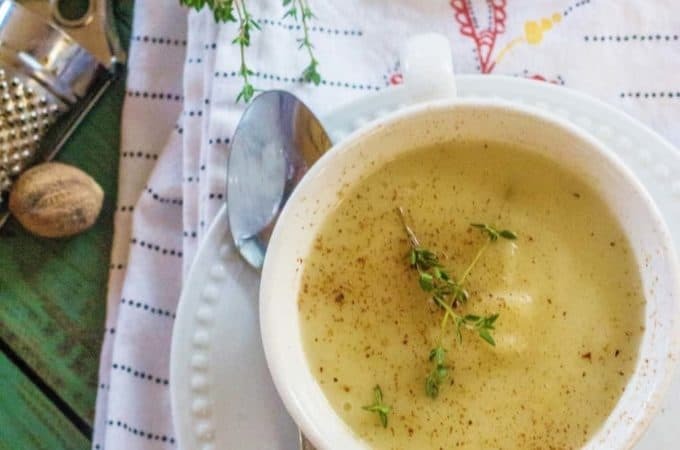 I have been craving Lemon everything lately and I seriously cant wait to get to the store tomorrow to buy the ingredients and make this. Not sure if I should wait til Sunday dinner. I hope you enjoy it, Tammy. I need to make it again, soon, so I can update the post with better photos. I might make it for Easter. I made this today, I followed the recipe to a T and the pie has not set, very liquidity still. Did I miss a step? Is there something else I should have added? So sorry for your troubles. I can’t imagine what went wrong. This recipe had been tested numerous times by others and myself. 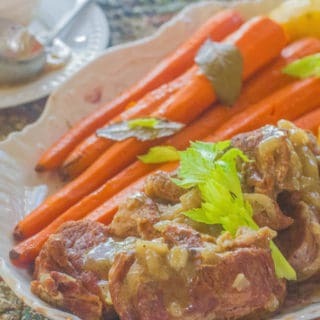 I want to thank you so much for putting this recipe out here for the Christmas holiday. I’ve been looking for this recipe. 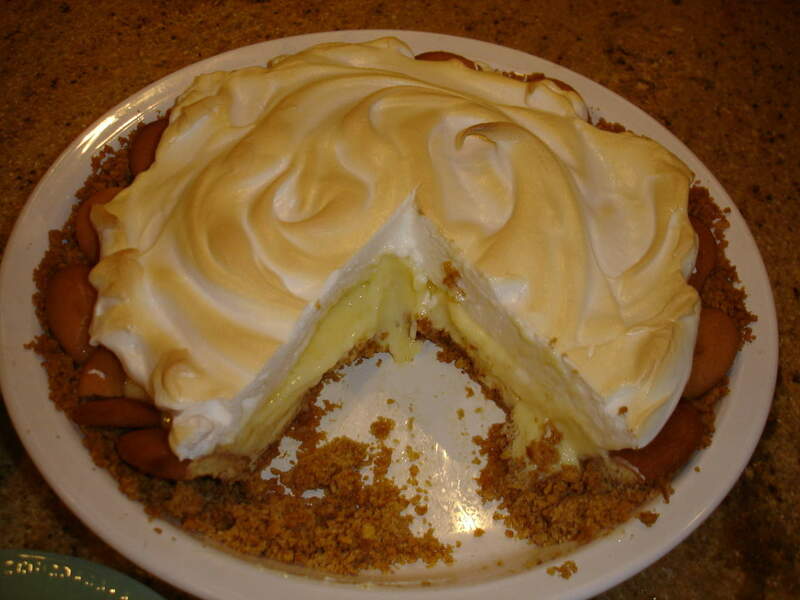 My mom was famous for two types of pies for Christmas, and Easter and on a special Sunday after church, which were, Icebox pie and Lemon Meringue pie. My mom was creole. When she died December, 2010, I called my youngest sister and asked did she have Mom’s Icebox pie recipe. She said yes, but she has to find it. I told her that I’ve goggle it, but I did not feel that those where it. She asked me what happened to yours. I told her after Katrina in 2005, I dont know were I put it. So I decided to goggle, Eagles brand condensed milk label from the 1950-1970’s. I found the label on Google, but not read it to well, so I still saveed it anyway hoping that me and my sister’s can make it out, and make it for this Christmas in the memorie of our MOM, because this is what we used to help her make. 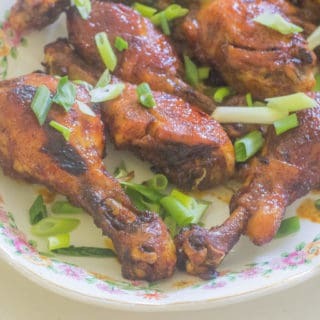 I said a prayer, and ask her if she can hear me, please help me to remember how to make this recipe. And my prayer was answered. Thank you so much! for putting your recipe out for this Icebox pie. I feel so blessed to find someone who make this pie with Nilla Wafer cookies. All the other are saying Gramcrakers .May you and your family have a blessed holiday. Awww! I’m so happy you found this recipe. Merry Christmas to you and your loved ones. God bless you. Your God sent. I been trying to find this Icebox Pie recipe for 8 yrs. I’m from New Orleans,LA. I have been goggleing for this recipe since November, for a Thanksgiving dessert. But all it kept giving me is Gramcrakers crust and not the Nilla Wafers cookies. My mom whom passed ,December 2010, of cancer. She always made these special pies for, Thanksgiving, Christmas, Easter,and Mother’s Day. The two pies were, the Icebox Pie and the Lemon Meringue Pie. How sweet this was for us doing those delicious desserts, because you got to wipe the bowls and spoons of that condense milk. I and my two sisters missed placed our Mom recipes after, Katrina in 2005. 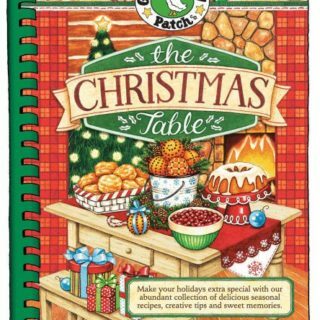 So thanks to you, you have made this Christmas special because the Icebox Pie will be made in her memory. And now I can pass this recipe ro my daughter, and two granddaughter. Your a blessing to me..
Lovell Brooks was my grandfather. Thanks for the kind words and the memory. I have many, many memories from that store. I hope you are still around to get the message so that you will know how touched I am by your recollection.